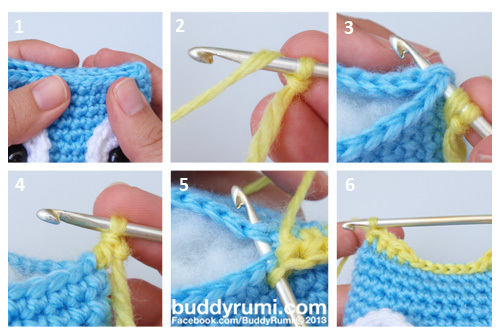 Today I want to show you three different ways how we can close the pieces on our amigurumi. I use this method for the most part of my pieces. It's very neat and the hole is closed completely. 1. Decrease the opening in your work until you have 6 to 8 stitches or less. 2. Thread a tapestry needle with the tail left from your work. Insert the needle under the next front loop. 3. Repeat for the remaining stitches pulling the yarn lightly. 4. Pull the yarn tightly until the hole closes completely. 5. Insert the needle under a loop close to the closed hole. Repeat one more time. 6. Pull the yarn until creating a loop and insert the needle into the loop. Pull the yarn creating a knot. 7. Insert the needle into the closed hole and make it come out as far as possible. 8. 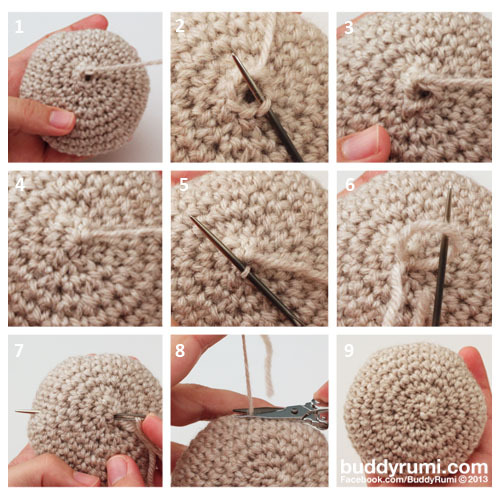 Pull the yarn until the knot disappears into the piece. Cut the yarn close to the piece, the end will disappear inside it. I use this method when I want the opened end to become flat. 1. Finish off the piece and leave a long tail. 2. Thread a tapestry needle with the tail left from your work. Insert the needle under the first and last stitch of the last round. 4. Insert the needle under the next stitch from thr front and the stitch from the back. 5. Pull yarn. Repeat for all the following stitches. I use this one when I want the opened end to become flat and pretty. 1. Pinch the front and back together and align the stitches side by side. 2. Make a slipknot on the hook. Because I'm working a half double crochet, I yarned over before the next step. 3. Insert the hook under the first pair of stitches (one from the back and another from the front). 4. Complete the stitch (in this case, a half double crochet). 5. Repeat steps 3 and 4 for the remaining stitches, working the stitches required by the pattern. 6. The piece is closed. Finish off and weave in ends.